This fifth film in the series is a prequel to the story of the other films. This means we have all the characters shown as their younger selves at the beginning of their careers per se, although, we do have one uncredited 20 second cameo in the film. I won't spoil it, but the audience laughed in recognition of the one actor playing a part from previous films. By the way, he did not look as twentyish as did the others. The story of the beginnings of the X-Men starts in the Nazi camps of World War II and finishes up in the early 1960's with the Cuban Missile Crisis. Since a prequel is essentially a reboot of the franchise, we get a completely new set of actors playing our favourite superheroes in a different time of their lives. It's the same, but it's not the same. Kevin Bacon has a pivotal role of the super-bad guy and seems to be doing his dialogue in various parts in native German and Russian. Hats off, Mr. Bacon if that's really your voice; you trained well. For anybody not in the know, this film targets the lover of Marvel comics. Now one may say this means the younger crowd but as somebody who grew up with comics, I'm not so sure that the target audience is necessarily just the younger crowd. If, however, no matter what your age is, you weren't into comics, this may be a film to take with a grain of salt or maybe just pass altogether. It's a decent film but like any film based on a comic book, there's a premise you have to swallow to make the whole thing work and if you can't quite make it with this suspension of belief, well, the supernatural or science fiction is not for you. The film has a running time of 132 minutes, over two hours, so you can say you're getting your money's worth in that regard. The film's budget is listed at $120 million and that isn't surprising considering the special effects. I've been given to understand that good special effects do not come cheap. The film is just now opening, June 3, so it will be interesting to see how it fairs financially, but the buzz I'm reading and the comments from both the public and critics is spreading a good word so I will not be surprised if it goes on to make a buck. I must add a note about the violence. You really don't see any. If somebody gets shot, it happens off camera; you merely hear the shot. I don't know if this was deliberate to get a certain rating, but I just checked the theatre I visited and the film is showing PG, Parental Guidance. Hmmm, does this leave entrance open to just about anybody? At least, all teenagers? "Here's twenty bucks, Johnny. Get lost." Just to let you know that there is nothing to see in the credits. There are no outtakes or other tidbits so feel free to get up and leave without worrying about missing anything unless, of course, you're like me who likes to watch the cast listing, the people behind the scenes, and check out the music used. Not a bad film, although if you're a diehard fan, you're going to see it no matter what I say. I think Roger Ebert chose the right word when he called it "competent" entertainment although with Rotten Tomatoes according it a rating of 87%, that's a little more than just competent. FYI: In an odd break with the latest and greatest in technology, the film is only offered in 2D. Go figure. X-Men: First Class is a 2011 American superhero film directed by Matthew Vaughn. It is based on the characters appearing in Marvel Comics and is the fifth installment of the X-Men film series and prequel to X-Men. 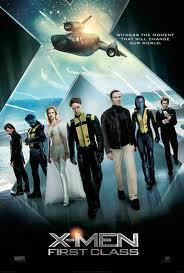 X-Men: First Class was released on June 1, 2011 in the U.K. and on June 3 in the United States. The X-Men film series is a series of superhero films based on the fictional Marvel Comics team of the same name. The films star an ensemble cast, focusing on Hugh Jackman as Wolverine, as he is drawn into the conflict between Professor Xavier (Patrick Stewart) and Magneto (Ian McKellen), who have opposing views on humanity's relationship with mutants: Xavier believes humanity and mutants can coexist, but Magneto believes a war is coming, and intends to fight. The films also developed subplots based on the comics' Weapon X and Dark Phoenix storylines.